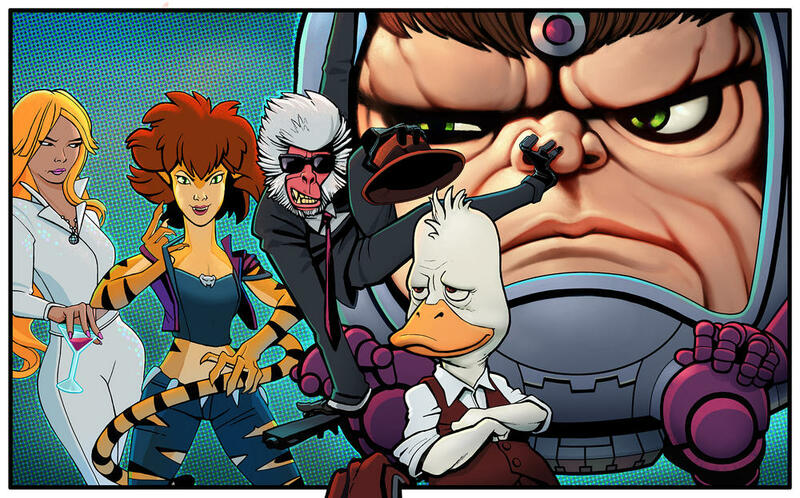 Marvel characters M.O.D.O.K., Hit-Monkey, Tigra, Dazzler, and Howard the Duck are all getting animated at Hulu – and hopefully you’re not (too) offended! Finally, nobody asked them to, and we’d be better off if they didn’t, but M.O.D.O.K., Dazzler, Tigra, Hit Monkey and Howard the Duck are all forced to team up in order to save the world and certain parts of the Universe in “Marvel’s The Offenders.” Jeph Loeb serves as Executive Producer, while writers and additional Executive Producers for the project will be announced at a later point. “A giant head. A monkey. A tiger lady and a disco queen. And the duck. Brought together because no one else could but Marvel Television on Hulu. M.O.D.O.K., Hit Monkey, Tigra & Dazzler and Howard the Duck will form a team no one asked for -- The Offenders (and wait until you see who the Team Leader is!)! We have such tremendous talent bringing amazing adult animation that's fun, fresh and fantastic. We're so excited for what's to come!" exclaimed executive producer Jeph Loeb, Head of Marvel Television. Last edited by Maestroneto; 02-11-2019 at 10:46 AM. Um, do Tigra and Dazzler even know each other in the comics? You forgot to post a link in the OP. Glad to see some exposure for Dazzler and Tigra. Last edited by Agent Z; 02-11-2019 at 10:47 AM. Disney's salvation of X-Franchises begins NOW! Twitter: "Tigra is getting a TV show with Dazzler"
The King Fears NO ONE! I was hoping Maestroneto was pulling a fast one on us. um, okay... thanks, I guess. Are they going to built an animated universe out of this? I do hope so. What in the world. This looks and sounds terrible. We get another animated show and they toss MODOK, Hitmonkey and Howard the Duck at us? Who asked for that?